The ABC.com website now has more details about the auction and also teases the fact that the venue will also be an exhibit, with sneal peak views of the extra season 6 material to be release on the DVD / BluRay sets. 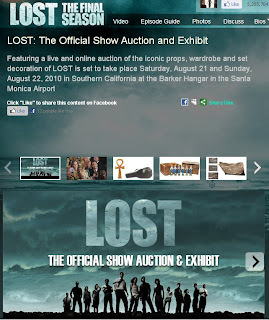 If you want to go down to the auction / exhibition then the site says that tickets for the event will be available at razorgator.com on Thursday, August 5th at 10am Pacific. Buyers are required to put up a $500 "good faith deposit" in order to bid. This will be charged to a credit card and then refunded if you don't win anything. If you do win, they'll take the bid amount off the $500 and refund you the difference. There has also been a bit of discussion in the comments about whether the items in the auction have been used on screen. Dan from The Prop Blog has been in touch to share some recent articles that may help you when deciding if you are going to bid for anything in the auction. Click Here for a prop buyers 101 on the terminology used to descibe items, it includes a descripton of what the term "Hero" means in the catalog. Now some articles that may scare some people off from the auction, however I think it is important that if someone is going to spend their hard earned money that they have as much information as possible. Read the information and let us know what you think. Of course if anyone from Profiles in History is reading and they wish to talk to us and present an alternative view then we will be happy to listen. I agree Ben, the auction house usually charges buyers and sellers so no one gets off without paying ! I've been to many auctions myself and always have to work out what my maximum is, with all the addons, before bidding so I don't get carried away. Thanks for the birthday wishes guys! Been a long time since I popped in here. I'm sorry to hear about your health issues Lisa, hope all of it turns out to be A-OK! This auction is making me wish I could win the lottery. Some awesome stuff on sale but at the same time, saves me having to deal with all these t&c's. Got back my last framed posters yesterday, olly's LOST and it looks amazing. Definitely one i'll be keeping forever with The Hatch. interesting stuff Zort ! I would be sad if that isn't really the Jesus stick used in the show, that was one of the main props. Happy Birthday Martyn !! Glad you came back to say hi. I could be something as easy as a infection behind my eye, no one seems to know. Off to another doctor today to see if he can figure it out. It will be fine. I'm not so scared now and worried. So the auction house is allowing itself the right to shill bid (something even Ebay ban) simply to make more money? That's out of order. Why don't they simply let the reserve do its job? The guide prices are a joke already. Its clear now there won't be any bargains. Its being manufactured to hit their expectations. I for one am not going to bother, especially when some items are dubious and often extra or "back up" items. I mean, why two different DS rings from two different seasons? If you still have the season one ring in your possession, wouldn't you use it on season 2? Its clear they probably made many from the mould, and two of these, that might not have even seen screen time, are being flogged off to the first mug willing to part with a mortgage payment. I'll remember lost through some great wall prints, not an over inflated chunk of something that might have been on the show. I think the whole set up is milking the fans. When a catalog of the auction items costs more than a Daniel Danger Black Rock limited edtion hand screen print, then something is amiss! I agree Ioioos and when you make a ring like the DS ring, they are made by casting - you just never only make one, more like 10-20 because they are small and easily lost. Its sad but people like me on a smaller income won't be buying anything any way. I will enjoy my posters and call it good. I bought a couple of props from the woman on ebay and that's good enough for me ! I love the bracelet I got. @ Lisa - Let's hope that it's only an infection. @ Martyn - Happy Birthday! I'm guessing that not as many people here are going to bid on anything anymore... I'm still interested in Charlie's guitar (screen-used or not) cause I need another acoustic guitar. My favorite would be Dogen's hourglass. I think it's beautiful- and I seem to recall a TV interview where the prop master said it was specially hand blown for the show. I guess they could have gotten more than one made, like everything else though. Is there a way to find out I wonder? OK- this is part one- and has the hourglass. Looks like it and the scale might be one of a kind. Sorry to be clumsy with links- maybe Zort can embed the You tubes. This confirms my suspicion that I won't be able to afford any of this stuff. Having been involved in television shows during my working years, I can verify that multiple items are made of a special prop at a time. If some of the items in the catalog were not actually used in the episode mentioned, I feel it should be so indicated. Also, the starting bids seem very high to me. Even though the catalog was pricey (and I thought hard before ordering it), I do feel it is a beautiful memento of most of the props on the show. It's probably all I'll take away from the auction. I do plan on attending it...to see the items in person and to hang out with a Lostie crowd one more time! Just got off the phone with Profiles in History as I had a couple of questions. Here's what i found out. 1) The lower dollar amount figure in the range listed for each item in the catalog is where the bids will all start. They will go up from there. The range is given as a starting place and then the higher number is around where the auction house in conjunction with ABC feels the item will close at. Of course this is subject to the items popularity, etc. Kind of lame. I feel like they should start lower to allow more people to at least bid. 2) If you complete a registration form for bidding and put up the $500 good faith deposit, you are allowed full access to both the auction AND the exhibit. There is no reason to buy an additional ticket tomorrow when they go on sale -- those are for those ONLY going to the exhibit and not registered bidders. However, such as in my case, my wife and I will both be attending and only one of us is registering for the auction. Both of us can go in to the auction and bid with one paddle, however, only ONE of us would be allowed access to the exhibit. So, the other person would have to either have to register to bid or purchase a ticket to enter the exhibit if they wanted to do that. Confusing? Yes! Yeah, I mean, it is a bit frustrating that some of the items may not be the onscreen version and that the minimum bid prices are higher. I am still planning on attending at this point. I may not leave with anything as there isn't TOO much in the old budget for it, but will be happy to be part of the experience and to see the exhibit of items on display. Still holding out hope that Hurley will be there to sign my catalog! I view it as a once in a lifetime opportunity to do something cool with LOST fans, and as one of the last official LOST hurrahs ever. An 8-hour drive is a small price to pay for that. Justin, thanks for the update. Both hubby and I are going...am very reluctant to put up $500...let alone $1,000 for both of us. The exhibit is more important to us. The starting bids for the items are a little high IMHO! So I'm going to try for 2 tickets tomorrow...it's our anniversary so maybe I'll be lucky! Hope to see you there! Yeah, I agree. Would love to see stuff starting at like $25 but then I guess devil's advocate says that then more people would bid, making the bid go higher anyway. So, in essence, maybe they're just saving time! But, still lame. Yeah, I'm definitely not putting up $1000 in good faith, but will probably be registering myself and putting up $500. I figure if I'm down there might as well have a paddle in my hand in case something is within reach that I want. And if I don't get anything, I get my $500 back. Justin- probably the reserve prices are all at least at the starting bids-so they wouldn't let anything go for e smaller amounts anyway. If I am understanding how this works correctly. hey guys... first things first i am disappointed at this information coming to light. (although glad)i was intending on spending a lot of money on these items, however i am now reserved in doing so. i want the on screen used items, but they were probably kept by the actors or abc. i understand that multiple were made for the shoot, but if the item was not used on screen i feel that it MUST be stated in the catalog. Unfortunately we all know that would mean less people would bid and that would mean alot less revenue for abc, and thats why i think they are misleading us. I will enjoy my posters and call it good. I bought a couple of props from the woman on ebay and that's good enough for me ! My sis bought me something from the ebay prop lady. Also, no guarantee it was used in an episode, but certainly a lot less expensive. Between the lovely gift, my prints and a lot of great memories following the show/Lost boards, I'm happy. -There are 8-10 copies of each costume piece by main actors. There were 3 warehouses full of costumes. -There is more than one of all important props- they thought 4 Locke' knives of the main one he used. -The rubber knives last a couple of episodes, and then there is a mold they use to cast more as needed. Rob's 2 favorite props that he designed were coming up in season 6. In other places I heard him say he really likes the scales and hourglass- so I think hey are the ones. I also see now, that this Auction will happen without my participation. The prices are really high and if I'm thinking about them as a start price, I will be perhaps really overrun by another people. But the cool thing about this Auction is the catalogue. Even if the print issue is also not really cheap, but they provided the downloadable PDFs of the catalogue, and it's really cool to browse across the items. How nostalgic! P.S. Actually the most thing I want, is the Daniels journal. But I hope, somebody who will buy it, will scan all the pages for our folks. It would be really nice. hey guys i think i might have found another difference.. this time in daniel faraday's journal.. http://1.bp.blogspot.com/_pG1kU-zfuxM/R8eExAnj8yI/AAAAAAAAAJk/HoZvhOKj6lk/s1600-h/screen-capture-14.jpg look at that and then the auction book. Hi all there is a NEW POST with the videos that JT mentions above. True, thaeagle2003, the notebooks seem to be different. Now that is lame, I almost have a feeling, as the books were produced for auction. But beside of all this things I still hope, the Prop people of LOST have scanned all the notebooks and documents, which are now about to be sold. So I hope, one day we could see good scans of all the scriblings and letters of LOST. Even if in a special Book. Even if I have to pay for it. ...me again. Sorry people for spamming. At least the Sawyers letter ("dear Mr. Sawyer") IS made for auction . (See catalogue Season1.PDF). Since Lilly Evangeline confirmed once, she stole the letter from set, and then the letter was unfortunately destroyed.